I really don't have much to say here. Next year, 2005, it will be a quarter century. As of yet, nothing, absolutely nothing has been done to show us that anything like justice will ever be done. Jagdish, Sajjan, et. al. are still out there enjoying themselves while we survivors are told to 'get over it.' I'll write no more right now. Anger is to be overcome, not nursed. 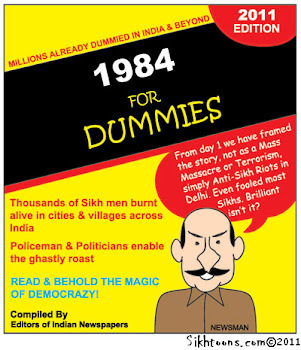 Missing the story: where was the media in 1984? WHO STARTED THE FIRE? The media followed the official line on riots in 1984. 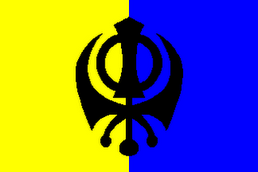 One man is willing to testify, Sikh groups he will inspire others. Babu Singh Dukhiya is the president of a 1984 riots victims' society and he is getting cynical. "A thousand years will pass but we still won't get justice. It took months and years in filing cases, recording statements and other such court work. Now it is almost 24 years since the riots," says Dukhiya. This veteran of countless protest marches says he never got attention to his demands. Mohan Singh, a riot victim, the media didn't pay attention during the 1984 riots. "In those days it was just Doordarshan for TV but now there are so many news channels. It is because of the media that there is hope of justice in the post-Godhra riots," says Mohan Singh. "The media by and large went by the official line on the carnage. It focused on the happenings at Teen Murti Bhawan, where Indira Gandhi's body lay in state and where from people around the world had come to pay respect. So photographers were flocking to that place and the killings that were simultaneously going on in the capital did not get recorded at all. It's bizarre but true," he says. The 2002 Gujarat riots in contrast got extensive media coverage, which helped human rights activists to prod both the judiciary as well as public conscience. "At the time of Gujarat riots all these TV channels played a very important role in bringing out the magnitude of the violence that was going on and the dubious role played by state authorities. As a result, the National Human Rights Commission and the Supreme Court had to take cognizance of high profile cases," says Mitta. Prime Minister Manmohan Singh in 2005 stood in Parliament to issue an apology on behalf of the Congress, admitting that the anti-Sikh riots were a shameful episode in India's history. "On behalf of our government, on behalf of the entire people of our country, I bow my head in shame that such a thing took place," he said. Congress leader Jagdish Tytler did resign from the Union Cabinet hours after the PM's apology, but no prominent politician or government official has been ever found guilty of involvement in the 1984 riots. "In all big cases involving major political leaders and involving large-scale killings, there have been absolutely no convictions at all. So, that contrast is there to see between what happened in 1984 and what happened in 2002," says Mitta. Lawyer H S Phoolka, who has represented 1984 riot victims for almost 24 years, admits he has not achieved much for his clients. The reason he alleges is sustained political pressure. "Some the judges were doing their duty very diligently and were giving orders of conviction, but the government manipulated in such a way that those judges were transferred. The cases then went to judges who looked pliable. Like we have mentioned one particular judge who was acquitting everybody. He decided 123 cases, out of which he acquitted 121," says Phoolka. India didn't pay attention to the riots in 1984 and now the danger is that it may forget them, say victims.